By the Way, as Ellen Brown has pointed out, the deposits made to the bank are the property of the bank until the customer withdraws them. So, the bank has the right to keep the money if insolvent. It is a loan to the bank gone bad! Second, the rising cost of commodities is made possible by QE from the Fed. The rising cost of commodities pushes up the price of housing, gasoline, food, etc. The QE could be used for the real economy, but that would heal the real economy and interest rates would go up. The Fed does not really want the real economy to heal for long, if at all. QE is used for speculation since it is not permitted to be used for loaning to main street. The banks view main street as a cancer, but the banks are the real cancer. Frugality and multigenerational living may be the only answers for many as we slip into economic decay. How much decay can we stand? Well, we know other great nations have withstood decay, as in the 1997 meltdown of the Russian economy and the 2001 meltdown of the Argentine economy. The 30 year loan will be out of reach for most, because the banks don't want to really tie up money that long anyway. They do make money by exotic easy no-money-down loans. And those may come back as they can be pawned off to investors by the guarantee made by Bernanke to give government backing to most loans going forward. Interest rates can go up a bit for the small time the bubble is in place, The banks make so much money on toxic loans that it could make the banks profitable for a time. But, as people start to default en masse, the hot, speculative, money will be withdrawn and interest rates must plunge downward fast. The method of operation is a diabolical one, and an attack upon main street. The cancerous To Big to Fail banks will stop at nothing to make a profit off the backs of everyone else, through low or slightly higher interest rates. The weak link to this austerity regime is the collateral that is used to back bank loans. If the collateral is backed by the government, there won't be a run on money market funds and banks. But all that backstop could put the government at risk of losing pristine credit ratings. Too many phony booms and busts with no real economic growth saddle the government with too much debt. Since good collateral is scarce, the failure of the United States to provide good collateral in her treasury bonds, and an abundance of loans gone bad that must have a government bailout, could ultimately prove to be the weak link in this banker dominated world financial system. But that could be years, even decades, away. Remember the last crash in 2008 was based on Mortgage Backed Securities (MBSs) being very bad collateral and the money market was spooked. There was a run on the money markets. Third, the low interest rate regime causes banks to win on the swaps. 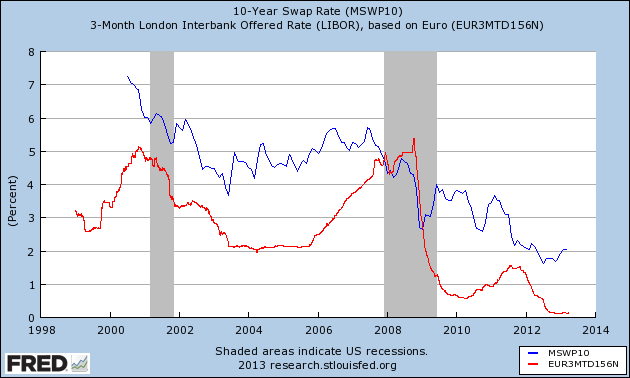 For example, the LIBOR rate in Euros, (I could not find a Fred graph with LIBOR in dollars but this will do), can be overlaid with the swap rate on fixed interest. The red line is the bank floating bet, ie LIBOR, and the blue line is the fixed rate taken by counterparties to the bank. That bumping of the LIBOR rate was the crisis for the banks. The banks were winning the "bet" until the spike. And the run up of LIBOR in 2006 and in to a lesser extent, in 2000 were the housing and the dot com bubble, in which banks made huge money on the housing and stock market businesses to offset the swaps deficiencies. Now that LIBOR is bumping along at zero interest rate, what is the strategy for the central banks now? They have LIBOR where they want it, and some of it was because of manipulation, so counterparties are suing the banks. Also, many counterparties are now forced to take the fixed rate side of the bet if they want a loan. The lender forces the company to take a variable rate loan, then offers protection in the form of an interest rate swap so that the company has a guaranteed fixed rate. The bank assumes the floating rate. The banks want that floating rate because they know that Ben Bernanke has their backs. The chart above proves it. The banks know the casino is rigged in their favor. They have better odds than the house in a Las Vegas casino! This forced protection is mob-like. It makes the mob look like small potatoes. If the counterparty, either government or private corporation, seeks to terminate the swap, there is a prepayment penalty, of course. And governments in the US have had to pay that penalty, though some , like Oakland, California, did contemplate just walking away from the toxic bets. And for LIBOR going negative, as the chart implies, even banks would have to pay for protection as is happening in Switzerland. But that is a whole other topic. That could result in more speculation, and maybe a few loans for main street. It may not be good if speculation is the result.